Thank you for coming to our 2019 press briefing on preliminary figures. We’re pleased to welcome you as our guests this evening, and glad to see representatives of international media here again. “Like a Bosch” – the energetic young man you just saw in the video is always on top of things and has everything under control, thanks to our connected solutions. That is our focus this evening as well. Ladies and gentlemen, automation, electrification, and connectivity will significantly transform the ways in which people and goods move around. An age in which the negative effects of traffic are the focus of attention, some of it critical, means technological challenges for companies. However, it also means business opportunities. That’s what we want to talk about today. When it comes to the transformation in mobility, artificial intelligence is a key technology. But its significance goes beyond that. It also heralds a technological, economic, social, and ethical revolution, the full impact of which is still difficult to assess. We will be touching on this topic this evening as well. But before we do, allow me to tell you a bit about our venue. We have already talked about the history of the building. Right now we are on the premises of the Bosch Connectory. Along with Chicago and Guadalajara, Stuttgart is home to what we call a co-innovation space: a location in an urban setting where we collaborate with partners, learn from one another, and put joint projects into practice. Each Connectory focuses on specific IoT domains. In Stuttgart, for instance, the focus is on digital supply chains and logistics. We bring together various partners, including established companies, startups, municipal institutions, and universities, to form an IoT community. Such partnerships and alliances are fundamental to success in the connected world. For now though, we want to focus on how well we did last year, and for that I will now hand over to Mr. Asenkerschbaumer. After a detailed review of business developments in 2018, he will present the outlook for the current year. Thank you, Mr. Denner. Ladies and gentlemen, good evening and welcome. Over the past few months, there have been signs that the global economic climate is changing. Indeed, our cautious forecast for 2018 anticipated this. So how did the Bosch Group do in the end? I will answer that by looking at our figures from operations. These rounded figures are adjusted for extraordinary effects resulting from changes in the consolidated group as well as from methodological changes. The figures are also adjusted for depreciation and amortization resulting from purchase price allocation. Let me state upfront that we were able to increase our sales and secure our result in an adverse environment. 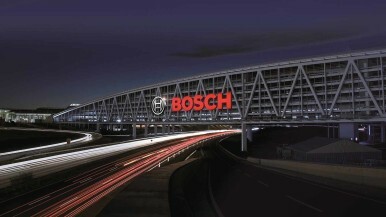 Bosch Group sales rose by 1.2 billion euros to 77.9 billion euros. Sales growth was 1.5 percent. After adjusting for exchange-rate effects, sales grew 4.3 percent. EBIT from operations stands at roughly 5.3 billion euros. EBIT margin from operations is expected to be 6.9 percent. Considering the economic environment, business developed well overall in 2018. Despite the difficult economic conditions and weak markets, sales and result reached last year’s high level. Adjusted for exchange-rate effects, our 4.3 percent sales growth was better than forecast. The negative impact of exchange rates amounted to 2.1 billion euros. This is the third time in a row that considerable exchange-rate effects have had a major impact on sales – a sign of political instability. Even though the figures also reflect exchange-rate effects and higher costs of materials, we were still able to achieve a strong result. Our EBIT margin also remains on a par with the previous year. Given the economic environment and the development of our markets, we can be satisfied with the way business developed. A look at the individual business sectors shows how strong growth was at Bosch, despite unfavorable economic conditions. 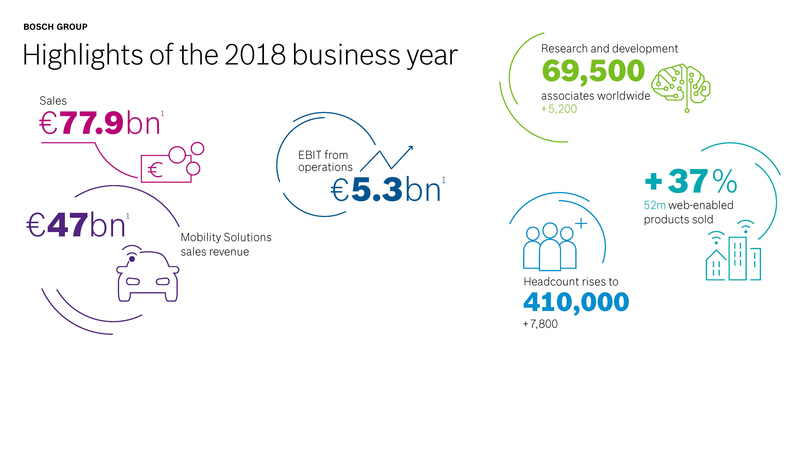 Mobility Solutions, the business sector which generates the highest share of sales, increased its sales revenue by 2.3 percent (4.7 percent after adjusting for exchange-rate effects) to 47 billion euros. This means that the sector’s sales once again outperformed global automotive production, which dipped below its previous-year level in 2018. Driving this encouraging development were our supplier business for commercial and off-road vehicles, the demand for driver assistance and exhaust-gas treatment systems, and e-bike drive units. Our Consumer Goods business sector posted a drop in sales revenue to 17.8 billion euros. Both the BSH Hausgeräte and Power Tools divisions were hit especially hard by exchange-rate effects and intense price pressure in their core markets. Adjusted for exchange-rate effects, sales are slightly above their previous-year level. Sales of the Industrial Technology business sector saw the strongest growth, with sales rising to 7.4 billion euros – an increase of 8.9 percent, or 11 percent after adjusting for exchange-rate effects. The main factor in this excellent development was the Drive and Control Technology division, which benefited from the recovery in the mechanical and industrial engineering market. As you know, we are currently planning to sell the sector’s packaging machinery business. The Energy and Building Technology business sector grew its sales to 5.5 billion euros, an increase of 2.3 percent, or 4.7 percent taking exchange-rate effects into account. Notable growth drivers include connected solutions for energy and building technology, and rising demand for services. So how did business develop across our various regions? In 2018, all regions except South America were able to achieve growth in nominal terms. Our company posted positive business developments in Europe, with sales rising to 41 billion euros. This equates to an increase of 2.1 percent, or 3.7 percent after adjusting for exchange-rate effects. Developments in Germany and Austria were particularly good, and Romania and Bulgaria saw double-digit growth. Bosch’s business in North America performed better year on year. Sales rose 2.8 percent to 12.3 billion euros. After adjusting for exchange-rate effects, sales increased by 7.9 percent. Here Bosch benefited primarily from its automotive business. In South America, Bosch Group business saw a year-on-year decline. Sales totaled 1.4 billion euros. Adjusted for exchange-rate effects, this is an increase of 8.9 percent. Nominally, however, it is a decline of 7.8 percent. This was mainly due to the extremely negative exchange-rate effects in our core markets of Brazil and Argentina. In Asia Pacific including Africa, sales came to 23.2 billion euros, as in the previous year. After adjusting for exchange-rate effects, sales grew 3.1 percent. Bosch was unable to evade the economic slowdown in China. Nonetheless, we have tripled our sales in China over the past five years. Asia Pacific now accounts for nearly 30 percent of total sales. Before my outlook for the current year, let’s look at how headcount developed. We saw encouraging development here as well: as of December 31, 2018, the Bosch Group employed some 410,000 associates worldwide. This is a year-on-year increase of 7,800. The largest increases in headcount took place in Europe and Asia Pacific. In our German home market, headcount rose by 1,700 to 139,500. Ladies and gentlemen, despite exceptionally volatile local economic conditions, the 2018 business year was a positive one. As we enter the new year, however, our expectations are subdued. We expect the global economy to grow just 2.3 percent in 2019. There are a series of geopolitical developments that will have a negative impact on private consumption and willingness to invest. They include the ongoing trade dispute between China and the United States as well as Brexit. A common pattern can be observed here, and not just behind the two developments I just mentioned. It is a rising, and at times aggressive, wave of nationalism, which manifests itself economically in protectionism, punitive tariffs, and withdrawal from free-trade agreements. In Europe, we are preparing ourselves for slightly weaker economic development. One reason for this is Brexit. It remains unclear just what course it will take. Of course, we plan in scenarios, but business would appreciate clarity on where it stands, as well as planning certainty. We expect momentum in North America to be subdued. The uptick in economic output last year came on the back of the reduced tax burden arising from tax reform as well as of substantial wage increases. This year, we anticipate a slight slowdown. Muted developments are also in the forecast for the emerging economies of South America. The region will continue to be affected by the crises in Venezuela and Argentina. Developments in Brazil depend on the new government and are difficult to predict at present. In Asia Pacific, we expect slow but stable growth. The main reason for this is the continued cooling of the Chinese economy, which is due in part to the high level of private-sector debt and the impact of the trade conflict with the United States. A look at the key industries that are important for Bosch bears out our cautious economic forecast. We assume global automotive production will decline further in 2019. This will affect all the major vehicle-producing countries, especially China. We are forecasting growth in only India and South America. The mechanical and industrial engineering sector will not be able to avoid fallout from economic and political developments. In the mechanical engineering sector, for example, order intake has recently taken a noticeable dip worldwide. This is why we are predicting considerably slower growth than in previous years. Private consumption, too, will not be able to maintain its high rate of expansion. Still, with the labor market in most countries remaining good and a growing higher-spending middle class in emerging Asian economies, it seems we can expect an above-average increase in consumer spending. So what does this mean for Bosch’s business targets? In the current year, we again want to develop more positively than the markets that are relevant for our business. In light of the uncertainty we face, we cannot yet say what that means for sales developments in concrete terms. Nonetheless, and despite considerable upfront investments, we want to secure a high level of earnings in 2019, and achieve EBIT of more than 5 billion euros. At the same time, we plan to make all our business sectors even more competitive in a bid to finance and drive forward the company’s transformation and its future viability. As an innovation leader, we want to shape change in our markets in both a technological and a business sense. This is especially true for the transformation in mobility. Mr. Denner will now address this topic, as well as the role of artificial intelligence. Thank you, Mr. Asenkerschbaumer. Ladies and gentlemen, when we look into the future, we of course look beyond 2019. Let’s consider the year 2050. The global population will be 9.7 billion. Of these people, 70 percent, or just under 7 billion, will live in cities (source: UN). Some 140 million people will be displaced persons, but not as a result of war and persecution. 140 million climate refugees will be escaping from drought, failed harvests, storm surges, and rising sea levels. The World Bank warns that climate change will be a driver of migration. But it also points out that things needn’t develop this way. The number of climate refugees can be reduced by 80 percent. One way of doing so is by reducing greenhouse-gas emissions. As an innovation leader, Bosch wants to play a leading part in this. With its technology “Invented for life,” it is in a position to do so. We see climate action as a driver of innovation. Energy efficiency has thus always been a recurring theme in the development departments of all Bosch business sectors. Climate change is a driving force behind our innovativeness. More than half our research and development expenditure is dedicated to products that conserve resources and protect the environment. Last year alone, we invested some 400 million euros in emissions-free mobility. After all, mobility is more than traffic and transport. Mobility is part of our individual quality of life. Mobility is freedom. Mobility determines how people come together, how people participate, how people are able to seize opportunities. Mobility and traffic are closely bound up with social and economic development. Mobility is vital. This is why our goal is to create mobility that has no negative impact on the environment. Climate action and environmental protection are also about changing mobility. Let me give you three facts: Fact 1: road traffic accounts for 18 percent of global CO2 emissions. Fact 2: apart from CO2 emissions, we also have to consider air quality. While it is becoming steadily better in many cities worldwide, in many emerging markets, it is getting worse as these economies grow. Fact 3: people around the world want to be mobile; they want to get from A to B in a way that is safe and stress-free. Demand for mobility is growing. Between 2015 and 2030, passenger traffic will increase by 50 percent. Goods traffic is expected to nearly double over the same period (source: ITF). But what must not be allowed to rise at the same rate is global and local emissions. So while we need more mobility, we also have to reduce environmental impact. The keys to this are automation, electrification, and connectivity. Local emissions in particular – improving air quality, in other words – is an area in which the search for completely new technological options should not be our sole focus. Existing powertrain concepts can also play a role here. Our engineers have achieved a breakthrough in diesel technology: a trial vehicle equipped with our diesel technology now emits just 13 milligrams of nitrogen oxide per kilometer in an RDE cycle. Thanks to this drastic reduction, vehicles can already meet future limits today. And not only that: diesel vehicles featuring our technology still consume less fuel and thus retain their superior carbon footprint. The use of non-fossil fuels, known as synfuels, could further improve the carbon footprint of combustion engines. Regrettably, the EU’s recent CO2 regulation missed the chance to further incentivize the use of these alternative fuels as a way of reducing mobility-related emissions. Potential for reducing carbon emissions is thus going untapped. To meet the EU’s more than ambitious CO2 regulation, plans for the mobility of tomorrow must be technology-neutral. Reducing CO2 emissions by 37.5 percent translates into average fleet consumption levels of 2.3 liters per 100 kilometers for diesel or 2.6 liters for gasoline – targets that are increasingly difficult to reach with current technology. Moreover, consumption should be measured under real driving conditions, as that is the only way to determine a realistic carbon footprint for each kilometer driven. And if we ignore the way fuel is produced and electricity generated, we will not be telling the whole story about road traffic’s carbon footprint. For this reason, we need to take a well-to-wheel view. Ladies and gentlemen, automated driving will also play a part in reducing carbon emissions. It consumes 30 percent less fuel, and 15 percent less on German freeways (source KEConsult). As we strive for mobility that is emissions-free, stress-free, and accident-free, therefore, one focus of our R&D spend is and will continue to be the automation of transport. The path to accident-free mobility requires a supreme effort – technologically and financially. Technologically, automated driving is much more than sensors, control units, and computing power; it also requires expertise in hardware, software, and services. Our advantage is that our engineers understand the vehicle as a whole, not just its individual parts. The amount of time and effort involved in developing automation is enormous, and correspondingly expensive. In the period up to 2022 alone, we expect upfront investments to total 4 billion euros. We are in a strong position here thanks to our solid financial position and good profitability. As we head toward accident-free mobility, we are pursuing two development paths. One is to continue writing a success story that began many years ago. Bosch premiered its first driver assistance system, ACC adaptive cruise control, back in 2000. Today we are the global leaders of that market. Sales of driver assistance systems will reach 2 billion euros this year, up from one billion three years ago. In private vehicles, these systems are gradually enabling partly automated driving in what we call automation levels 2 and 3. The second development path will take us to levels 4 and 5. Together with Daimler, we will be testing an automated ridesharing service this year in San José, California. The objective of this development partnership is driverless driving. But amid all the fascination with self-driving cars, we must not lose sight of the goal of automated transport: to make mobility accident-free. Traffic accidents are the most common cause of death among children and young people aged 5 to 29. Every 24 seconds, somebody is killed in road traffic (source: WHO). One-fourth of these victims are pedestrians and cyclists. That is precisely why we invest so much R&D effort in automated driving. For our customers, the benefit will be the highest safety standards for automated driving. Ladies and gentlemen, driverless driving will become a game changer for individual mobility, for both users and providers. It will open the door to disruptive business models such as robotaxis and shuttle-based mobility. Thanks to automation, driverless commercial vehicles can be available 24 hours a day, 7 days a week. Indeed, this is the only way the considerable investment in this expensive technology will pay for itself. The market potential is huge: over the next ten years, analysts expect the market for automated-driving hardware and software to be worth some 60 billion dollars (source: Roland Berger). By 2025, there will be 2.5 million on-demand shuttle buses on the roads in Europe, the U.S., and China alone – the majority of them driverless (source: Roland Berger). In 15 years, people using ridesharing vehicles will account for 20 percent of all kilometers driven (source: BCG). As early as 2030, one-third of people living in Europe will find it cheaper to use self-driving taxis than to purchase a car (source: BCG). Our portfolio features components for automating, electrifying, and connecting the vehicles themselves, and also includes our mobility services. The Bosch ecosystem combines solutions and services for reservations, payment, parking, recharging, administration, maintenance, and infotainment. At CES, we debuted our portfolio in a concept shuttle. It is also clear that most of these shuttles or pods will be electric vehicles. Our objectives here are no less ambitious: we aim to lead the mass market for electromobility. In this endeavor, we are relying on our systems expertise and the development and manufacture of key components, such as the electric motor, power electronics, and battery systems. Just as today we say “there’s no car on the planet without a bit of Bosch in it,” in the future we will say that there’s no electric car on the planet without a bit of Bosch in it. In the electromobility business, no company is as broadly diversified as Bosch. From bicycles to trucks, we electrify all powertrains. Our e-bike drives have made us leaders of a market we created ourselves. Today, more than a million cars around the world are equipped with Bosch electric or hybrid components. By 2025, we plan to increase our sales in electromobility more than tenfold to 5 billion euros. In 2018 alone, we acquired 30 projects worth several billion euros. For example, we entered into a strategic partnership with the Chinese electric vehicle manufacturer NIO for automated and electric driving. Our 48-volt battery, suitable for compact and sub-compact cars as well, went into mass production a few weeks ago in Wuxi, China. By 2030, a 48-volt system will support the combustion engine in 20 percent of new vehicles. Also in China, this year will see the start of production for the e-axle, our drive solution for electric cars. One further important step is the complete acquisition of EM-motive GmbH. It is one of the most successful manufacturers of electric motors in Europe. This new ownership structure will allow us to benefit even more from the fast-growing global demand for electric motors. Ladies and gentlemen, we want trucks to be beasts of burden, but not a burden for the climate or for air quality. Again, the keys here are optimized combustion engines and electrification – particularly last-mile logistics, or inner-city delivery traffic. More than ten million packages are delivered every day in Germany alone (source: Bundesverband Paket und Expresslogistik, or Germany’s Federal Association for Delivery and Express Logistics). Each package is responsible for 500g of CO2 emissions (source: DHL). As early as 2030, one in four new commercial vehicles worldwide – nearly one in three in China – will be at least partly electrically powered. Regarding the electrification of goods transport, we will be ready when the market is. Our product portfolio covers the entire spectrum of possible applications: 36-volt power packs for cargo e-bikes, electric motors for light commercial vehicles – such as those powering the roughly 10,000 StreetScooters already on Germany’s roads – e-axles for light and heavy vans, electrified axles for semitrailers, and, in the future, fuel-cell powertrains for 40-ton trucks. Fuel cells in particular could one day realize their full potential on long-haul routes, in vehicles with few stationary periods, and in commercial vehicles. And if hydrogen infrastructure is further expanded for commercial vehicles, the filling stations may eventually welcome passenger cars one day as well. We are currently working with commercial vehicle manufacturers worldwide to make fuel-cell powertrains a reality. At the same time, we are looking into partnerships for developing and manufacturing the components. When it comes to fuel cells as well, therefore, we are ready for the market. Electromobility is clearly gaining momentum. China, the largest market for electric vehicles, broke the one-million mark in 2018 for the number of electrified vehicles sold, an increase of more than 60 percent. Bosch is the market leader there for passenger cars. In Germany, too, sales in 2018 saw a year-on-year increase of more than 25 percent (source: Center of Automotive Management). This year, manufacturers around the world will have over 130 new electric vehicles – some fully electric, some hybrid – in their salesrooms (source: McKinsey). As supply grows, so too does demand. In fact, nearly 40 percent of German drivers now consider electric models when purchasing a new car (source: McKinsey). However, more than two-thirds of those surveyed name long recharging times, too few charge spots, or limited range as reasons for not buying an electric vehicle (source: Statista). That is why our electromobility strategy goes far beyond the powertrain. We have expertise throughout the entire electromobility ecosystem. We not only electrify powertrains, but we make electromobility suitable for everyday use – for example, with our Convenience Charging service, a connected navigation and recharging solution for electric vehicles. Convenience Charging combines vehicle data such as battery charge, the driver’s driving style, and the energy consumed by heating or air conditioning systems with information from the vehicle’s surroundings, such as the current temperature and traffic situation. This allows us to predict vehicle range especially accurately. Furthermore, Convenience Charging scans its database of 40,000 charge spots across Europe to find the ideal one, which it can reserve in advance. And thanks to a standardized access and payment system, recharging is easier and more stress-free than ever. Our first regular customer is the German electric vehicle manufacturer Sono Motors, and we are in talks with several other manufacturers. Convenience Charging is one of 25 mobility services in the portfolio of our new Connected Mobility Solutions division. These services also include sharing of electric vans in cooperation with the toom DIY chain and the SPLT ridesharing service. The transformation in mobility is also a transformation in user behavior. By 2025, there will be more than 470 million connected vehicles on the world’s roads (source: PwC). Just three years from now, the market for mobility services and associated digital services will be worth 140 billion euros (source: PwC). Similarly, we expect our connected mobility solutions business to see double-digit growth. Ladies and gentlemen, one technology in particular will do more than any other to advance the transformation in mobility: artificial intelligence. Self-driving and driverless cars, for example, are artificial intelligence on four wheels. I’m talking here about industrial AI; in other words, smart algorithms combined with expertise in the traffic, industry, and building domains. It offers far more potential than the consumer-industry AI which is dominated by American and Chinese players. The promise of AI lies primarily in its potential as a basic technology that enables numerous subsequent innovations. AI will do more than revolutionize traffic; It will support people in many aspects of everyday life, in their work, in their free time, and in looking after their health. Our objectives for AI are clear. First, as an innovation leader, we want to master the technology ourselves. We want to be a global leader in AI research. Second, by the middle of the next decade, all our products are to be equipped with AI, or AI is to have played a part in their development and manufacture. Third, we want to leverage AI to make meaningful and purposeful use of the data that products generate in the internet of things. We want to turn Bosch products into intelligent assistants for people. The Bosch Center for Artificial Intelligence is working on nearly 150 projects in the domains of mobility, manufacturing, smart homes, and agriculture. One of these is the Bosch SoundSee sensor system. By precisely predicting machine downtimes, the system makes it possible to reduce maintenance costs and improve productivity. To do so, the SoundSee algorithm analyzes subtle acoustic clues in the characteristic sounds of motors and pumps to determine if anything is broken. It can also “hear” whether the problem affects the entire machine or only individual components. By the middle of this year, the SoundSee solution will be deployed on the International Space Station (ISS) to analyze the station’s acoustics. We see commercial applications in manufacturing, buildings, and automotive engineering. Another example is the multi-purpose camera, on display in the exhibit. It takes automotive camera technology to a new level. Vehicles equipped with this camera can perceive their surroundings much more reliably – a key requirement for automated driving. The camera combines image-processing algorithms with AI methods for the first time. For example, machine learning helps the camera detect a driving lane even if there are no markings. It can also distinguish between surfaces such as asphalt, gravel, and grass. As a result, the vehicle remains in its lane at all times. Furthermore, the multi-purpose camera is better than the human eye. For instance, it can spot pedestrians on the side of the road and analyze line of sight, head position, and direction of movement to deduce whether they are about to step out onto the road and there is a risk of them being hit. Ultimately, it will not least be user acceptance that determines the extent to which humanity benefits from AI. We also have to prepare ourselves for the AI revolution from an ethical and regulatory perspective. We are researching and developing AI that is safe, robust, and explainable. “Explainable” means that the decisions AI makes have to be open and transparent. In addition, human intelligence is the ultimate decision-making authority for artificial intelligence, too. Societies must discuss the ethical and moral implications and set regulatory guidelines. At the same time, regulation must not act as a brake on innovation and investment. The German government’s AI strategy acknowledges this balance, and sees a need for action especially on the use of data. We are currently engaged in an intensive discussion with associates, customers, partners, and top researchers in the natural sciences and the humanities on precisely the subject of AI security and AI ethics. The aim of this dialog is to draw up a set of AI principles that provide our engineers with an ethical and moral frame of reference for their work, especially for gray areas and dilemmas. Bosch views AI as a core area of expertise. Over the next three years, we aim to quadruple the number of AI experts in the company – from 1,000 today to 4,000. In the international competition for AI talent, our position is a strong one, and this for three reasons: first, talented people always want to work with other talented people. Second, an algorithm needs the right learning material if it is to become smart – and that material is data. And who better to provide this data than a company that in the past year alone sold 52 million web-enabled products and operates 280 manufacturing plants around the world? Third, our values-based way of working with technology sets us apart from the competition. We are also building up digital skills among our current associates. Every year we invest more than 250 million euros in further training for them. Digital skills are part of all occupational training programs. Rethinking mobility and technology also means rethinking how we learn. With the Bosch Learning Company initiative, further training today is more than off-the-job training with the company; instead, further training is an integral part of our corporate strategy. We have two goals here: one is to make sure our associates are ready and willing to enter new business areas. This means providing them with training. The other is to encourage them to take responsibility for their own learning in less structured settings. One example of this is the Working Out Loud initiative you heard about earlier on. We view working and learning as two parts of a whole. This is why we are integrating learning into our associates’ daily routines. We supplement traditional classroom learning with video options through virtual classrooms and apps for learning on the go. Since the start of the year, our associates have been able to share their knowledge and expertise on Bosch Tube, the company’s version of YouTube. It not only includes all the educational videos that Bosch offers, but also allows associates to create and upload their own video tutorials. After all, further training also means learning from one’s colleagues. Collaboration and leadership are two fundamental elements of any corporate culture. We have taken a long, hard look at both aspects. The result was the “We are Bosch” mission statement as well as the “We lead Bosch” leadership principles. Both are important guides for agile everyday work in a volatile environment. As part of the ongoing transformation, we have also redesigned the way corporate headquarters works with the operating units. Headquarters has just one task: to provide the best possible support for our businesses. Specifically, this means helping to shape the transformation of our business with mobility solutions and IoT connectivity. To this end, at the start of the year we simplified structures in corporate service areas such as purchasing and human resources. From now on, instead of reporting to eight management board members, the corporate departments will be headed by four of us – the four here tonight. The other members will be responsible solely for the operating units. For example, Mr. Hartung represents the Mobility Solutions sector. We are calling this project “Bosch Aheadquarters.” The name expresses our motivation and the task we have set ourselves of always staying ahead of the times. Ladies and gentlemen, this brings me to my closing remarks. Always staying ahead of the times is not a maxim that applies to our headquarters alone. 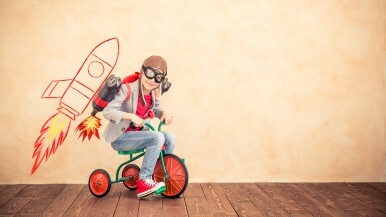 It is precisely what an innovation and technology leader aspires to do. Thank you very much. My colleagues and I are now looking forward to your questions.